Call (816) 260-5775 For A Free Estimate! This commercial grade epoxy seamless chip flooring system is a highly decorative, three dimensional floor finish designed to add value and beauty to any home or business. Stencils and logo are easily incorporated using this system. Ultra Surface Color Flake is great for garages, basements, kitchens, or any interior part of a home where traffic is extreme. It is available in many colors and colors can be customized to your specifications. Color Flake is very durable and is a mop clean type floor finish. See our selections below and see how we can help you with your Kansas City epoxy floor. Metallic epoxy floors create beautiful reflective surfaces. Metallic pigments are added and create a beautiful and mesmerizing floor that will be sure to wow your guests! Dramatic flairs can be added by choosing a metallic flooring coating system. These metallic epoxy floors can create a sense of depth that other flooring systems can lack. Metallic floors have recently picked up in popularity. Here at KC Artistic Concrete we take pride in saying that there is no color or metallic design that we cannot create for our customers. Our floors are handcrafted using our custom designed metallic stains. Due to the application techniques of installing metallic epoxy floors, each metallic floor is truly a unique and one of a kind! We are proud to offer quality metallic epoxy flooring services to the Kansas City area! Unlike other floors that are made with tile, carpet, or wooding, our concrete floors are made to last! Our epoxy floor coating products withstand regular wear and tear that keep your metallic floor looking beautiful. 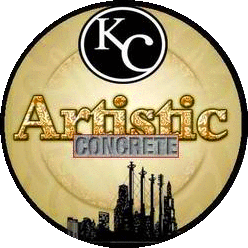 KC Artistic Concrete is a decorative concrete company located here in Kansas City. We are a small but hardworking decorative concrete company that specializes in epoxy flooring. Here at KC Artistic Concrete we take pride in the determination, patience, and attention to detail our employees bring to each concrete job. We have the tools and drive to bring your flooring vision to life!